We use flashcards to begin every session so that our children are confident in their recognition of the letters on the page, and those which they will select for writing. 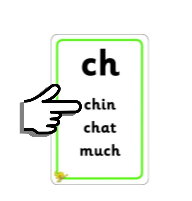 Each flashcard helps children to memorise each sound through use of a picture and a ‘code’ e.g. 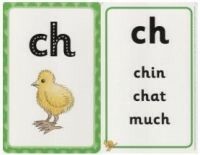 children would say “s, as in sun” and “ch, as in chick” when presented with the following flashcards. It is important that children have rapid recall of the sounds of the English alphabetic code; that they are taught to form the letters using the correct sequence of movements, are able to blend the sounds together for reading e.g. 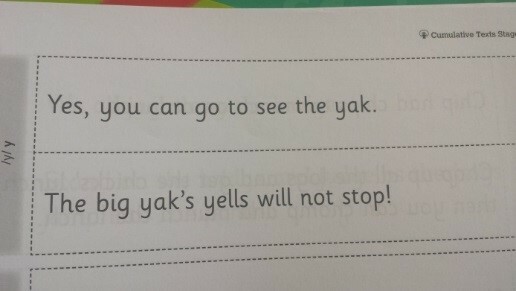 “s-a-t, sat” and segment a word into its individual sounds to write words accurately e.g. “cat, c-a-t”. 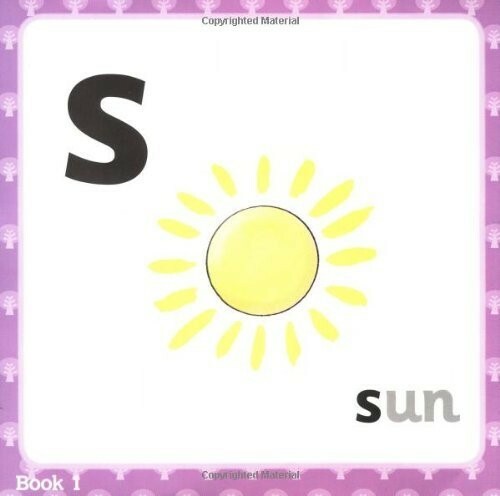 On the back of each flashcard, there are a series of words for the teacher to model how to read the words – after which children will have chance to mirror the adult and learn the skill for themselves. Blending follows a set routine, with each sound in the word being pointed to, left to right across the page, as it is spoken e.g. “ch-i-n”. 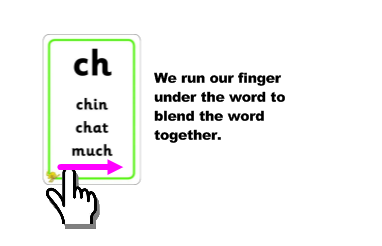 The reader would then swipe their finger left to right across the page as they blend the sounds together to form the word “chin”. To develop fluency, children are then encouraged to read the words without the need to repeat the individual sounds. 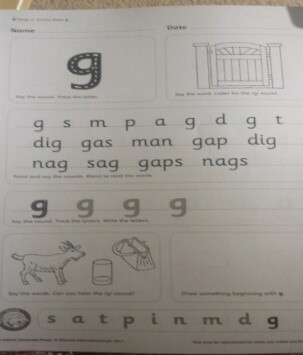 This simple resource allows pupils to memorise the alphabetic code, to practice their reading by blending a set of words with the focus sounds in and to develop their understanding of the words they are reading by finding out about word meaning, within the session.The third step is essential as there can be an over reliance on decoding and blending every word when developing these skills. Phonics sessions are a vital part of every school day at Forest, with all pupils enjoying 30 minutes of phonics learning each day. The session is split into approximately 15 minutes reading (blending), followed by 15 minutes of spelling (segmenting). Pupils work independently throughout this session to complete sound activity sheets. Children move on to independently read sentences and drawing a picture to show their understanding of the sentence. The session, overall, provides excellent opportunity to develop pencil control as it includes handwriting practice, colouring and drawing – three very traditional skills which will never be anything less than vital to your child’s future success! 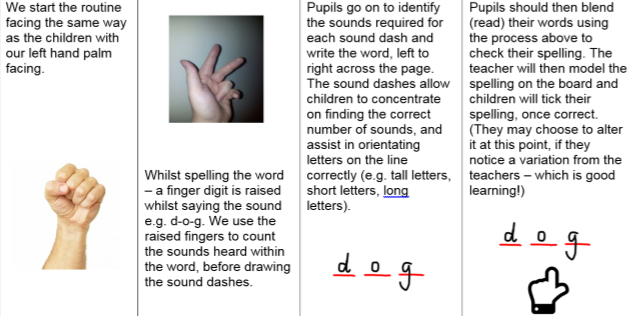 In the last 15 minutes of the session, pupils go on to practice spelling by sounding out the words they are told to spell by their teacher, following the spelling and editing routine. 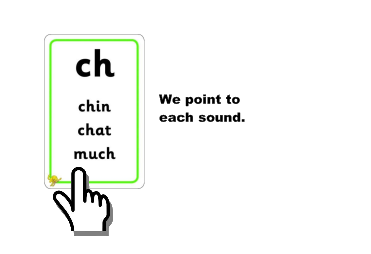 This routine is designed to enable children to hear and identify the correct number of phonemes (sounds) in words and encode them by selecting the corresponding (correct) graphemes. Parents can help their children to learn the phonics code through LOTS of practice! 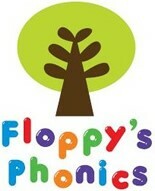 Phonics Activity sheets will be sent home daily for you to re-do with your child, consolidating the learning in school.